Welcome back from our holidays on which, we trust, you had as much fun reading the four refresher pieces as I had writing them. Utter nonsense, of course. I’ve never found writing to be an orgasmic activity but, as they say about cod liver oil, it is good for you. However, whilst we were all improving ourselves on our deck-chairs and sun-loungers, the Tide of Science was waiting for no man: the waves of cancer biology have obliterated our sand castles and are fast approaching our toes. So let’s get on – albeit doing our best to make the segue from vacation to vocation as seamless as possible …..
Fortunately, being blasé has its limits. The only time I’ve made it to the Grand Canyon the mid-winter sun highlighted the colours of the rock striations so they were breathtaking in a way no photograph could quite capture. 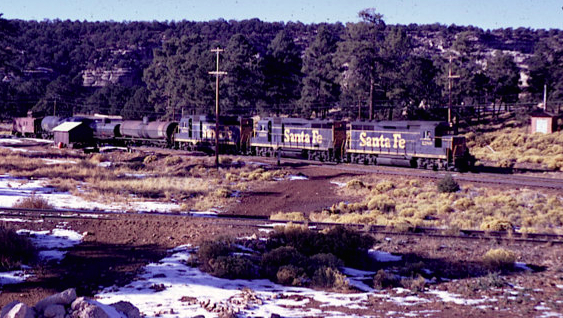 In the same vein, everyone should take the Trans-Siberian Railway we’re often told. And so you should but not because you will see houses and churches, rivers and trees that you can’t find on the Internet but because only borne by the train do you begin to sense the immensity of Mother Russia. The fact that the scenery is almost entirely birch trees minimizes distraction: all you can do is contemplate vastness – and the harshness that brings – an unvarying obbligato to Russian life. But in focusing on cancers – what happens at the molecular level as they develop and how they evade our attempts to control them – the fine detail of this nigh-on incomprehensible power has been revealed as in no other way. You’ll know what’s coming: the biggest single boost to this unveiling has been the arrival in the twenty-first century of methods for sequencing DNA and identifying which genes are expressed in cells at any given time. I know: in umpteen blogs I’ve gone on about its awe-inspiring power – but it is stunning and we’re at that stage when new developments leave one gasping almost on a monthly basis. The point here is that it’s not that the science keeps getting turned on its head. Far from it: the message remains that cells pick up changes to their DNA and, with time, these cumulative effects may drive them to make more of themselves than they should. That’s cancer. But what is fantastic is the molecular detail that the ’omics revolution continues to lay bare. And that’s important because, as we have come to recognize that every cancer is unique, ideally we need to provide specifically tailored treatments, and we can only think of doing that when we know all the facts – even if taking them in demands a good deal of lying down in darkened rooms! You could think of the fine molecular detail of cancers as corresponding to musical ornaments – flourishes that don’t change the overall tune but without which the piece would be unrecognizable. These include trills and turns – and all musicians will know their appoggiaturas from their acciaccaturas. They’re tiny embellishments – but just try removing them from almost any piece of music. So let’s look at three recent papers that have used these fabulous methods to unveil as never before the life history of cancers. The first is another masterful offering from The Sanger Institute on breast cancer: an in-depth analysis of 12 patients in which each tumor was sampled from 8 different locations. In the main the mutation patterns differed between regions of the same tumour. They extended this by looking at samples from four patients with multi-focal disease (‘foci’ being small clumps of tumour cells). As expected, individual foci turned out to be clearly genetically related to their neighbours but they also had many ‘private mutations’ – a term usually meaning a mutation found only in a single family or a small population. Here the ‘family’ are individual foci that must have arisen from a common ancestor, and you could think of them as a cellular diaspora – a localised spreading – which makes them a kind of metastasis. Quite often the mutations acquired in these focal sub-clones included major ‘driver’ genes (e.g., P53, PIK3CA and BRCA2). In general such potent mutations tend to be early events but in these foci they’ve appeared relatively late in tumour development. This doesn’t upend our basic picture: it’s just another example of ‘anything goes’ in cancer – but it does make the point that identifying therapeutic targets requires high-depth sequencing to track how individual cancers have evolved through continual acquisition of new mutations and the expansion of individual clones. The authors used ‘coxcomb’ plots to portray these goings-on but they are quite tricky to make head or tail of. So, to avoid detail overload, I’ve converted some into genetic wallpaper, the non-repeating patterns illustrating the breathtaking variety that has evolved. Decorative DNA. The discs are ‘coxcomb’ plots – a variant of a pie chart. Here the colours and the wedge sizes represent mutations in different regions of four primary breast tumours. Every disc is different so that the message from this genetic wallpaper is of mutational variation not only between cancers but across the different samples taken from a single tumour. I trust that Lucy Yates, Peter Campbell and their colleagues will not be too upset at my turning their work into art (and greatly abbreviating the story): you can read the original in all its wondrous glory in Nature Medicine 21, 751–759. The first person to come up with this very graphic way of conveying information was Florence Nightingale who, whilst working in Turkey during the Crimean War, realized that soldiers were dying in the hospitals not only from their wounds but, in much greater numbers, from preventable causes including infections, malnutrition and poor sanitation. Her meticulous recording and original presentation of hospital death tolls made her a pioneer in applied statistics and established the importance of sanitation in hospitals. Two equally powerful onslaughts from Gunes Gundem, Peter Campbell and their colleagues at The Sanger Institute (again!) and Dan Robinson and pals from the University of Michigan Medical School have revealed the corresponding molecular detail of prostate cancer. Here too the picture is of each region of a tumour being unique in DNA terms. Moreover, they showed that metastasis-to-metastasis spread was common, either through the seeding of single clones or by the transfer of multiple tumour clones between metastatic sites. Even that miserable old sod Lenin might have brightened at such fabulous science, before reverting to Eeyore mode with the inevitable “What’s to be done?” But it’s a good question. For example, as a general strategy should we try to kill the bulk of the tumour cells or aim for clones that, although small, carry very potent mutations. Aside from the basic science, there is one quite bright ray of sunshine: about 90% of the mutations linked with the spread of prostate cancer are potentially treatable with existing drugs. And that really is encouraging, given that the disease kills 11,000 in the UK and over 30,000 in the USA every year. 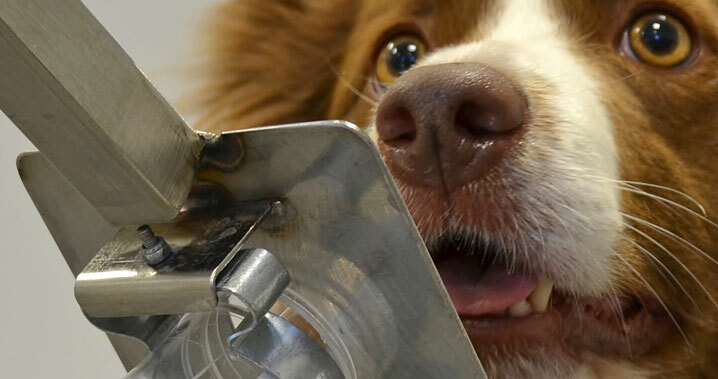 We might also be heartened by the skills of German Shepherd dogs that can, apparently, be persuaded to apply one of their favourite pastimes – sniffing – to the detection of prostate cancer. Point them at a urine sample and 90% of the time they come up with the right answer. Given the well-known unreliability of the prostate-specific antigen blood test for prostate cancer, it’s nice to think that man’s best friend is on the job. Yates, L.R., et al. (2015). Subclonal diversification of primary breast cancer revealed by multiregion sequencing. Nature Medicine 21, 751–759. Robinson, D., et al. (2015). Integrative Clinical Genomics of Advanced Prostate Cancer. Cell 161, 1215–1228. Gundem, G., et al. (2015). The evolutionary history of lethal metastatic prostate cancer. ICGC Prostate UK Group (2015). Nature 520, 353–357. Holiday Reading (4) – Can We Make Resistance Futile? For those with a fondness for happy endings we should note that, despite the shortcomings of available drugs, the prospects for patients with a range of cancers have increased significantly over the latter part of the twentieth century. The overall 5-year survival rate for white Americans diagnosed between 1996 and 2004 with breast cancer was 91%; for prostate cancer and non-Hodgkin’s lymphoma the figures were 99% and 66%, respectively. These figures are part of a long-term trend of increasingly effective cancer treatment and there is no doubt that the advances in chemotherapy summarised in the earlier Holiday Readings are contributory factor. Nonetheless, the precise contribution of drug treatments remains controversial and impossible to disentangle quantitatively from other significant factors, notably earlier detection and improved surgical and radiotherapeutic methods. Peering into the future there is no question that the gradual introduction of new anti-cancer drugs will continue and that those coming into use will be more specific and therefore less unpleasant to use. By developing combinations of drugs that can simultaneously poke the blancmange at several points it may be possible to confront tumor cells with a multiple challenge that even their nimbleness can’t evade, thereby eliminating the problem of drug resistance. Perhaps, therefore, in 20 years time we will have a drug cabinet sufficiently well stocked with cocktails that the major cancers can be tackled at key stages in their evolution, as defined by their genetic signature. However, on the cautionary side we should note that in the limited number of studies thus far the effect of drug combinations on remission times has not been startling, being measured in months rather than years or decades. Having noted the durability of cancer cells we should not be surprised by this and the concern, of course, is that, however ingenious our efforts to develop drug cocktails, we may always come second to the adaptability of nature. Equally perturbing is the fact that over 90% of cancer deaths arise from primary tumors spreading to other sites around the body. For this phenomenon, called metastasis, there are currently very few treatment options available and the magnitude of this problem is reflected in the fact that for metastatic breast cancer there has been little change in the survival rates over the past forty years. It might appear somewhat churlish, especially after all that funding, to end on a note of defeatist gloom so let’s finish with my ray of sunshine that represents a radical approach to the problem. It relies on the fact that small numbers of cells break away from tumors and pass into the circulation. In addition, tumours can release both DNA and small sacs – like little cells – that contain DNA, proteins and RNAs (nucleic acids closely related to DNA). These small, secreted vesicles are called exosomes – a special form of messengers, communicating with other cells by fusing to them. By transferring molecules between cells, exosomes may play a role in mediating the immune response and they are now recognized as key regulators of tumour growth and metastasis. Step forward Lyden and friends once more who have just shown in a mouse model of pancreatic cancer that exosomes found their way to the liver during the tumour’s earliest stages. 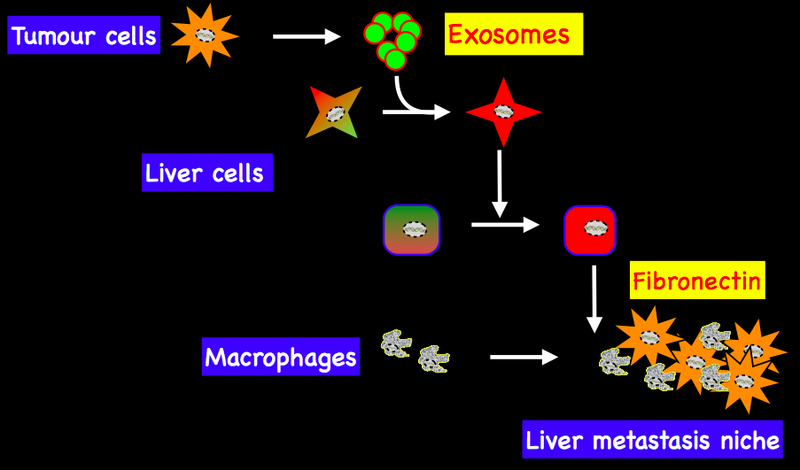 Exosomes are taken up by some of the liver cells and this sets off a chain of cell-to-cell signals that eventually cause the accumulation of a kind of molecular glue (fibronectin). This is the critical ingredient in a microenvironment that attracts tumour cells and promotes their growth as a metastasis (secondary growth). So you can think of exosomes as a kind of environmental educator. 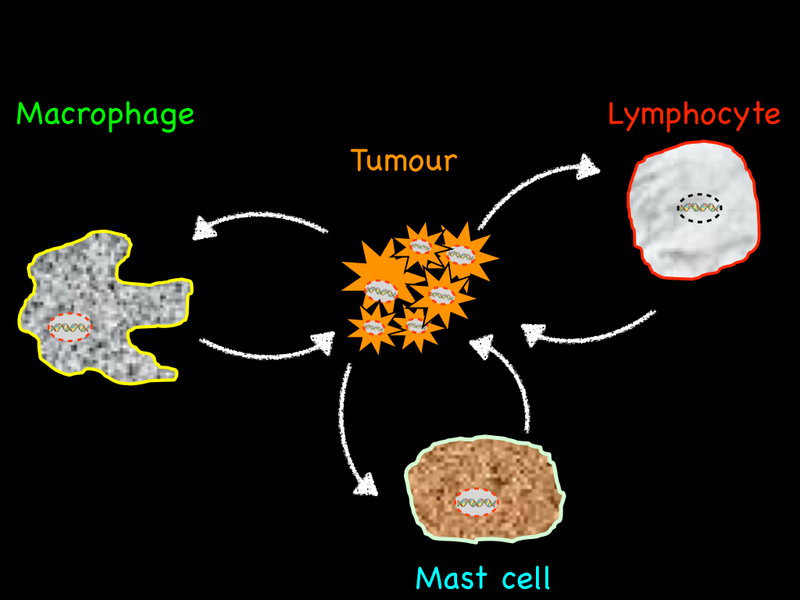 Exosomes released from primary tumours can mark a niche for metastasis. The small sacs of goodies called exosomes are carried to the liver where they fuse with some cells, setting off a chain reaction that produces a sticky protein – fibronectin – a kind of glue for immune cells and tumour cells. (from Costa-Silva, B., Lyden, D. et al., Nature Cell Biology 17, 816–826, 2015). The recent, remarkable technical advances that permit the isolation of exosomes also make it possible to fish out circulating tumour cells and tumour DNA from a mere teaspoonful of blood. Circulating tumour cells have already been used to monitor patient responses to chemotherapy – when a treatment works the numbers drop: a gradual rise is the earliest indicator of the treatment failing. Even more exciting, this approach offers the possibility of detecting the presence of cancers years, perhaps decades, earlier than can presently be achieved. Coupling this to the capacity to sequence the DNA of the isolated cells to yield a genetic signature of the individual tumor can provide the basis for drug treatment. There are still considerable reservations attached to this approach but if it does drastically shift the stage at which we can detect tumors it may also transpire that their more naïve forms, in which fewer mutations have accumulated, are more susceptible to inhibitory drugs. If that were to be the case then even our currently rather bare, though slowly expanding, drug cabinet may turn out to be quite powerful. The mutations that drive cancers fall into two major groups: those that reduce or eliminate the activity of affected proteins and those that have the opposite effect and render the protein abnormally active. It’s intuitively easy to see how the latter work: if a protein (or more than one) in a pathway that tells cells to proliferate becomes more efficient the process is accelerated. Less obvious is how losing an activity might have a similar effect but this comes about because the process by which one cell becomes two (called the cell cycle) is controlled by both positive and negative factors (accelerators and brakes if you will). This concept of a balancing act – signals pulling in opposite directions – is a common theme in biology. In the complex and ever changing environment of a cell the pressure to reproduce is balanced by cues that ask crucial questions. Are there sufficient nutrients available to support growth? Is the DNA undamaged, i.e. in a fit state to be replicated? If the answer to any of these questions is ‘no’ the cell cycle machinery applies the brakes, so that operations are suspended until circumstances change. The loss of negative regulators releases a critical restraint so that cells have a green light to divide even when they should not – a recipe for cancer. 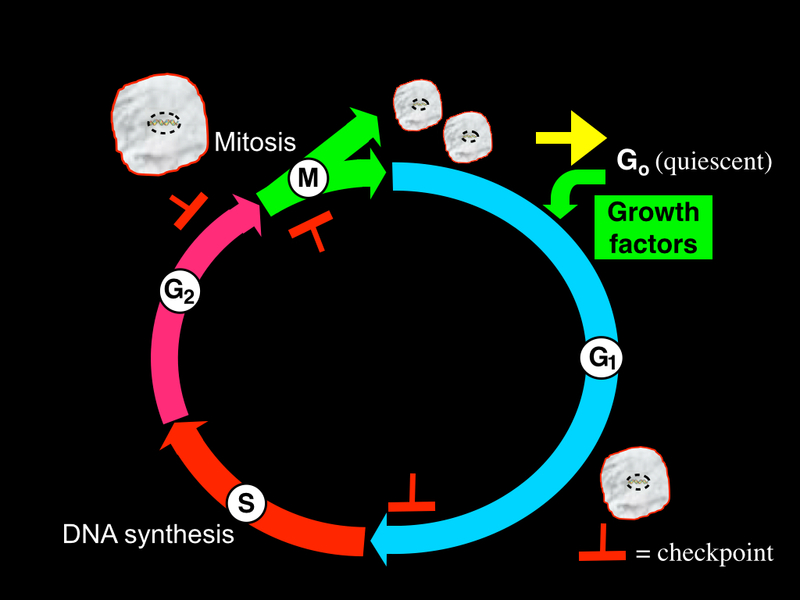 Cells are stimulated by growth factors to leave a quiescent state (G0) and enter the cell cycle – two growth phases (G1 & G2), S phase where DNA is duplicated and mitosis (M) in which the cells divide to give to identical daughter cells. Checkpoints can arrest progression if, for example, DNA is damaged. Because loss of key negative regulators occurs in almost all cancers it is a high priority to find ways of replacing inactivated or lost genes. Thus far, however, successful ‘gene therapy’ approaches have not been forthcoming with perhaps the exception of the emerging field of immunotherapy. The aim here is to boost the activity of the immune system of an individual – in other words to give an innate anti-cancer defense a helping hand. The immune system can affect solid cancers through what’s become known as the tumour microenvironment – the variety of cells and messengers that flock to the site of the abnormal growth. We’ve referred to these as ‘groupies’ and they include white blood cells. They’re drawn to the scene of the crime by chemical signals released by the tumour – the initial aim being to liquidate the intruder (i.e. tumour cells). However, if this fails, a two-way communication sees would-be killers converted to avid supporters that are essential for cancer development and spread. The tumour microenvironment. Tumour cells release chemical messengers that attract other types of cell, in particular those that mediate the immune response. If the cancer cells are not eliminated a two-way signaling system is established that helps tumour development. There is much optimism that this will evolve into a really effective therapy but it is too early for unreserved confidence. The obstacle of reversing mutations that eliminate the function of a gene has led to the current position in which practically all anti-cancer agents in use are inhibitors, that is, they block the activity of a protein (or proteins) resulting in the arrest of cell proliferation – which may ultimately lead to cell death. Almost all these drugs are not specific for tumour cells: they hit some component of the cell replication machinery and will block division in any cell they reach – which is why so many give rise to the side-effects notoriously associated with cancer chemotherapy. For example, the taxanes – widely used in this context – stick to protein cables to prevent them from pulling duplicated DNA strands apart so that cells, in effect, become frozen in final stages of division. Other classes of agent target different aspects of the cell cycle. It is somewhat surprising that non-tumour specific agents work as well as they do but their obvious shortcomings have provided a major incentive for the development of ‘specific’ drugs – meaning ones that hit only tumour cells and leave normal tissue alone. Several of these have come into use over the past 15 years and more are in various stages of clinical trials. They’re specific because they knock out the activity of mutant proteins that are made only in tumour cells. Notable examples are Zelboraf® manufactured by Roche (hits the mutated form of a cell messenger – called BRAF – that drives a high proportion of malignant melanomas) and Gleevec® (Novartis AG: blocks a hybrid protein – BCR-ABL – that is usually formed in a type of leukemia). These ‘targeted therapies’ are designed to not so much to poke the blancmange as to zap it by knocking out the activity of critical mutant proteins that are the product of cancer evolution. And they have produced spectacular remissions. However, in common with all other anti-cancer drugs, they suffer from the shortcoming that, almost inevitably, tumours develop resistance to their effects and the disease re-surfaces. The most remarkable and distressing aspect of drug resistance is that it commonly occurs on a timescale of months. Tumour cells use two tactics to neutralize anything thrown at them before it can neutralize them. One is to treat the agent as garbage and activate proteins in the cell membrane that pump it out. That’s pretty smart but what’s really staggering is the flexibility cells show in adapting their signal pathways to counter the effect of a drug blocking a specific target. Just about any feat of molecular gymnastics that you can imagine has been shown to occur, ranging from switching to other pathways in the signalling network to short-circuit the block, to evolving secondary mutations in the target mutant protein so that the drug can no longer stick to it. Launching specific drugs at cells may give them a mighty poke in a particularly tender spot, and indeed many cells may die as a result, but almost inevitably some survive. The blancmange shakes itself, comes up with a counter and gets down to business again. This quite extraordinary resilience of tumour cells derives from the infinite adaptability of the genome and we might do well to reflect that in trying to come up with anti-cancer drugs we are taking on an adversary that has overcome the challenges involved in generating the umpteen million species to have emerged during the earth’s lifetime. Not the least disheartening aspect of this scenario is that when tumours recur after an initial drug treatment they are often more efficient at propagating themselves, i.e. more aggressive, than their precursors.